Hapag Lloyd’s container vessel “Hong Kong Express”, with over 13 000 TEU capacity, berthed at DCT Gdansk on Tuesday, 11th of August. Maiden call of this G6 Alliance affiliated vessel officially inaugurated cooperation between DCT Gdansk and members of the Alliance: APL, Hyundai Merchant Marine (HMM), Mitsui O.S.K. Lines (MOL), Hapag-Lloyd, Nippon Yusen Kaisha (NYK) and Orient Overseas Container Line (OOCL). “For the last five years DCT Gdansk was building its position of the biggest container hub in the Baltic Sea. Attractiveness of our unique ability to handle ultra large container carriers coming directly from Far East has been confirmed by G6 Alliance’s decision to include Gdansk call in their Loop 7 port rotation. We are very happy to welcome all partners of G6 Alliance in Gdansk and we are sure that this is just a beginning of our long and mutually beneficial cooperation” says Maciek Kwiatkowski, CEO of DCT Gdansk. 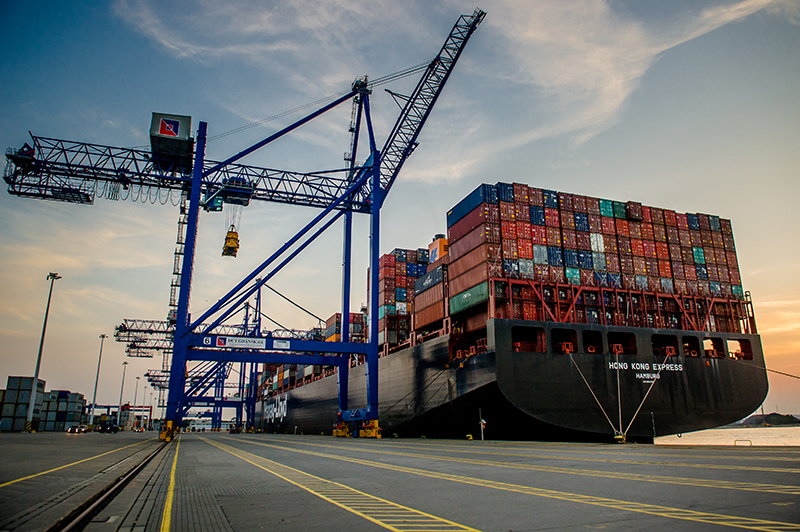 The G6 Alliance Loop 7 is a weekly service calling at 6 European ports in the following rotation: Rotterdam, Hamburg, Gdansk, Gothenburg, Antwerp and Southampton before crossing the Indian Ocean to Asia. In Asia, Loop 7 calls Qingdao, Shanghai, Hong Kong, Yantian and Singapore.